Feeling lucky? Casinos offer a variety of games for the most intermediate players, to the most advanced. From black jack, to craps, to penny slots, there’s fun for everyone to enjoy. Though some think of Las Vegas when it comes to gambling, Southern California also provides casinos that combine the thrill of winning with activities outside of the hotel. If you’re planning a group trip and need casino transportation, book with BEST-VIP and know you’re making a sure bet! Here are just a few of the premier gambling destinations, sure to deliver a variety of games and plenty of opportunities to win big. The mecca for casinos, shopping, restaurants and entertainment, one thing is for sure: Las Vegas is a city that needs no introduction. Nevada’s largest city has long outgrown its adult playground connotation. It has truly earned its spot as one of the world’s premier tourist destinations, and no one can accuse Las Vegas of being a one-trip gambling pony these days. Each grand building is a destination unto itself, bursting with magnificent amenities and attractions to satisfy anyone under the sun. And in almost every hotel? Casinos! With far too many to name, Las Vegas is the ultimate stop for those wanting luxury and VIP treatment. Serving as a destination resort, this bustling hotel and casino is 10.7 miles from Hellhole Canyon Preserve and 19 miles from the San Diego Zoo Safari Park. Harrah’s offers luxury pools with lazy rivers, fantastic shopping, pristine golf courses, and a casino that offers reel slots, video slots, a large variety of single and multi-level progressives and Southern California’s largest variety of video poker. The Pechanga Resort and Casino has the largest casino floor in California totaling 188,000 sq ft. The casino features over 4,000 slot machines, 154 table games, a non-smoking poker room with 38 tables, and an ultra-modern, 700-seat bingo facility. Located in Temecula, CA, it is surrounded by Southern California wine country, boutiques, many golf courses and unique restaurants, bringing a more casual approach to spending a weekend away with your group. Admire midcentury modern homes, take a mountaintop tram ride and embark on a dining and leisure experience unlike any other when you visit Palm Springs, California. Seasonally, it becomes the epicenter of cool when it hosts Coachella, Stagecoach and the design-focused Modernism Week. Another gem hidden in this desert oasis? Agua Caliente Casino! This Palm Springs area hi-rise casino compound is first-class and Las Vegas in style — with the design, glitz and glamour of the latest and best slot machines and table games. 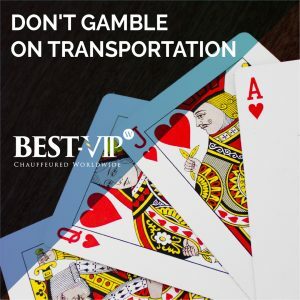 When it comes to casino transportation, BEST-VIP offers first class service with safety in mind. Some casinos offer free transportation to the casino from a certain pick up spot, at a certain time. When booking with BEST-VIP, you can schedule one of our motorcoaches to pick you and your group up from any point, at any time you desire! BEST-VIP’s motorcoaches seat 40 and 50 passengers with 452 cubic feet of luggage storage to suit your bags and your winnings! Every Luxury Motorcoach at BEST-VIP Chauffeured Worldwide includes six 10” LCD Overhead Monitors, iPod connectors and reading lights for your entertainment pleasure during the journey. We understand that planning group travel isn’t easy. That’s why we provide you with a dedicated group specialist that will help you select the vehicle that best fits your group size, manage your logistical needs, ensure you stay within budget and oversee all the tiny details leading up to your trip. Your group specialist is supported by our 24/7 customer support, to ensure any minute changes are handled, no matter the time of day or night. You work hard to play hard, so don’t roll the dice when it comes to booking casino transportation – make a sure bet and book with BEST-VIP!